The Seed Swap is a fun-filled family event and is open to anyone interested in seeds, food growing and organic gardening. A fantastic opportunity to pick up or swap a diverse selection of seeds including unusual and tasty varieties, meet some fellow gardeners and exchange growing tips, experiences and resources. At the same time the event offers a chance to participate in building and strengthening local food security, reclaiming seed sovereignty, supporting organic practices, developing local connections and sharing local knowledge and skills. If you’re up for learning, discussing and sharing ideas, there will be a range of talks focussing on various earthly and food growing issues. There will also be fun activities for kids, a range of stalls with information about local growing and environmental groups, plants, fruit trees, local produce and local craftwork. All served with a large helping of deliciously fruity live music, freshly prepared cakes, a hearty soup and your finest teas and healthy juices! 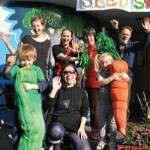 Sowing and swapping seeds for a healthy community. If you have surplus seeds to share/swap, please bring them along in a labelled envelope or other container. A large selection of seeds have also been very kindly donated by Chiltern Seeds, Edwin Tucker and Thompson Morgan. The Bristol 2013 Seed Swap Event offers a great opportunity to visit and support these pioneering food growing initiatives located on the infamous and endangered Blue Finger in Stapleton, some of the most fertile land in the country, listed as grade 1 agricultural land. A beautiful green field site, buzzing with wildlife and a hive of community food growing activity. As part of The Big Dig both Feed Bristol and Sims Hill CSA will also be putting on a range of engaging food growing and land based activities. Keep watching our websites for further details. One for the diary! Directions to site: Feed Bristol is located on the junction of Frenchay Park Rd and Stoke Lane in Stapleton (BS16 1HB). The entrance is by the traffic lights on Frenchay Park Road. Please cycle or use public transport if you can. There is a great cycle route through Eastville Park to nearby Snuff Mills. Local buses stop right outside the site.